Feed dogs. 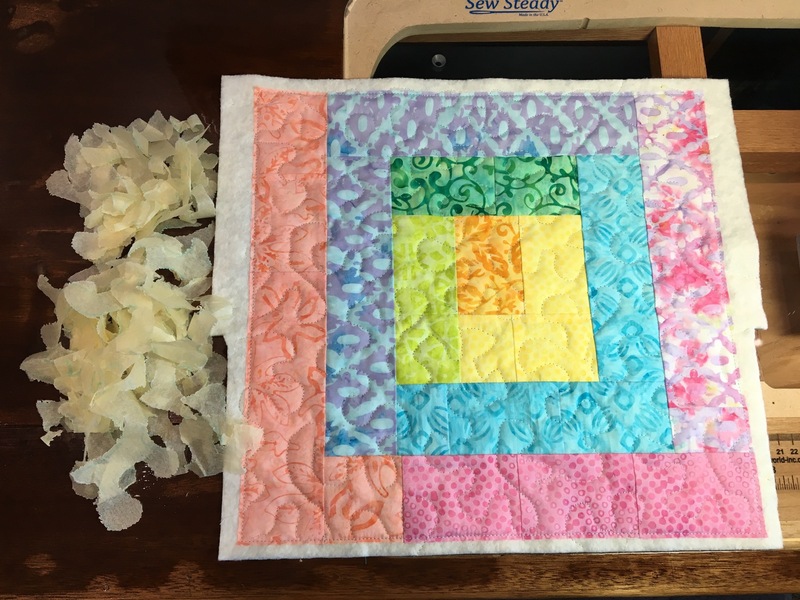 I finally got around to dropping the feed dogs and trying out some free motion quilting. What did you think I meant? 🙂 I’ve had my current sewing machine for seven years now, but have been too intimidated to drop the feed dogs and go for it. But something stirred in me last month and I just had to try it. I was contemplating doing my own quilting on a wall hanging which would require something besides straight lines, and knew that I’d have to start smaller and practice, practice, practice. 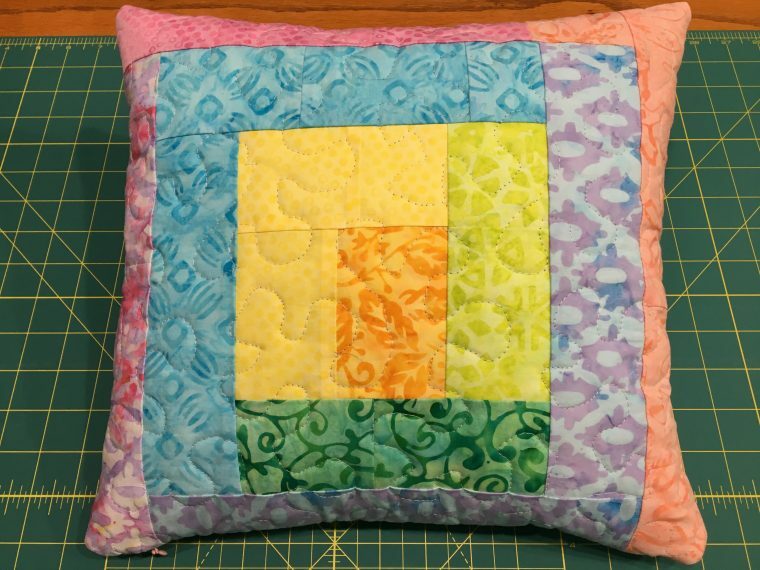 So I took some scraps from a batik quilt top I recently finished (it’s currently in queue at the longarm), and made a pillow front and pillow back. Just a couple small squares that should be easy peasy, right? Not. This is going to take way more practice than I think I have patience for. On the pillow front I used some tracing paper to make a stipple type pattern to follow. My plan was to follow the line (I give myself about a D+, maybe C-) and then rip out the tracing paper. That would have been fine if my stitches had been small enough and even. Not so much. I think my stitches ranged from infinitesimal to about 3/8″. I did get better as I went, but some of those longer stitches got really stressed when I started pulling the paper out. 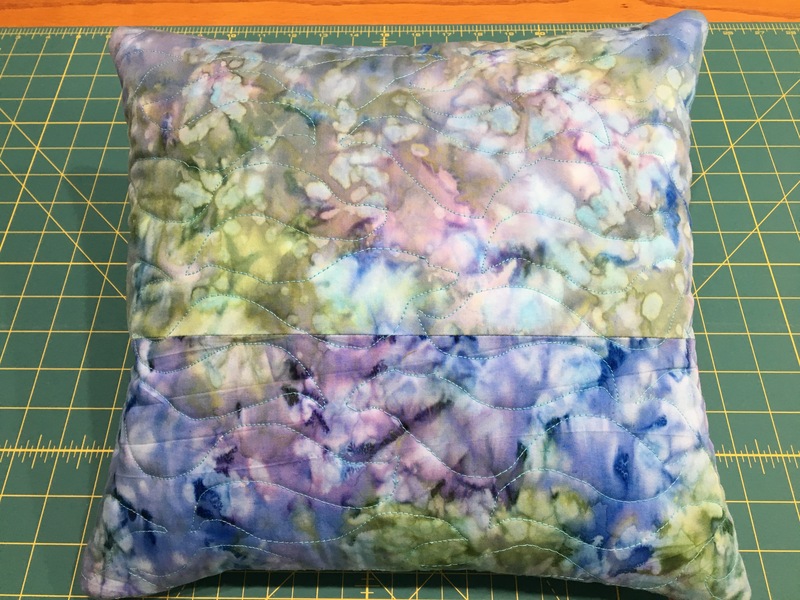 On the pillow back I opted for a similar process, but I printed the pattern on newsprint thinking it would be easier to tear. It was, but only slightly. And I went for a different pattern that I thought would be easier. The stipple sometimes doubled back on itself, and I couldn’t tell where it was headed behind the sewing machine. So I found a “flame” sort of pattern that mostly went from back to front, with a little side to side motion. That was better for being able to see the lines, but I still couldn’t follow them very well. Another D+. Once again, I did get better on following the lines, but the stitch length consistency did not improve. More practice. I’m glad I tried dropping the feed dogs, and I’m really glad I did it on scraps. 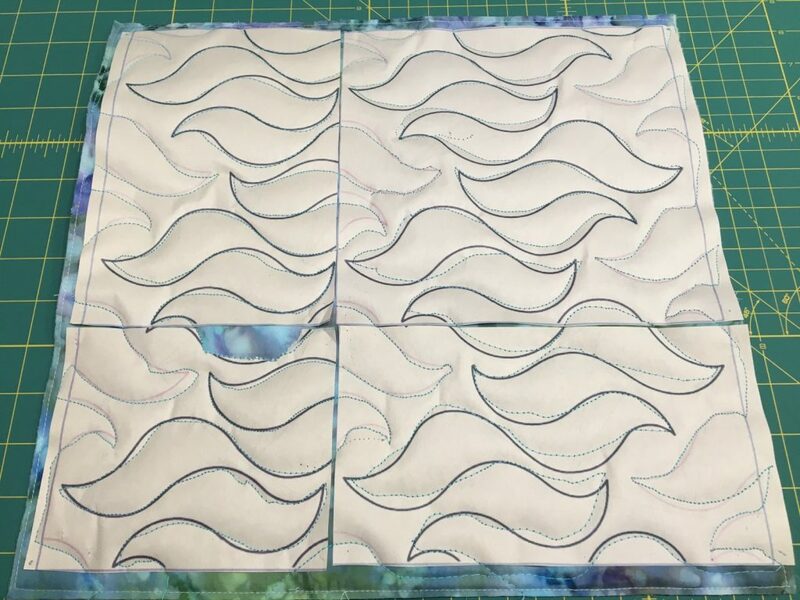 There will be a lot more testing on scraps before I ever get close to quilting something that I actually care about. 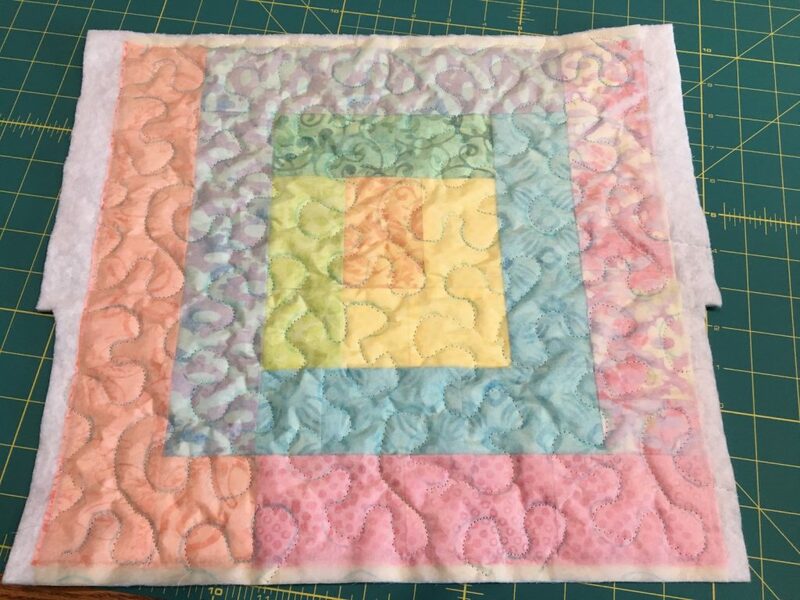 And that wall hanging I was contemplating quilting myself? 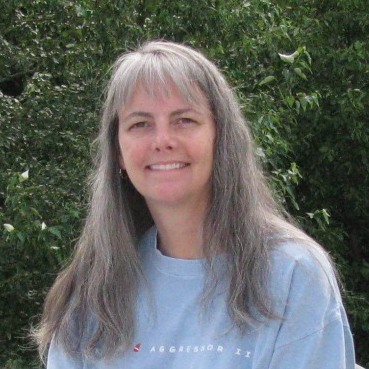 My friend Susan suggested that I try her longarm. Shiver! 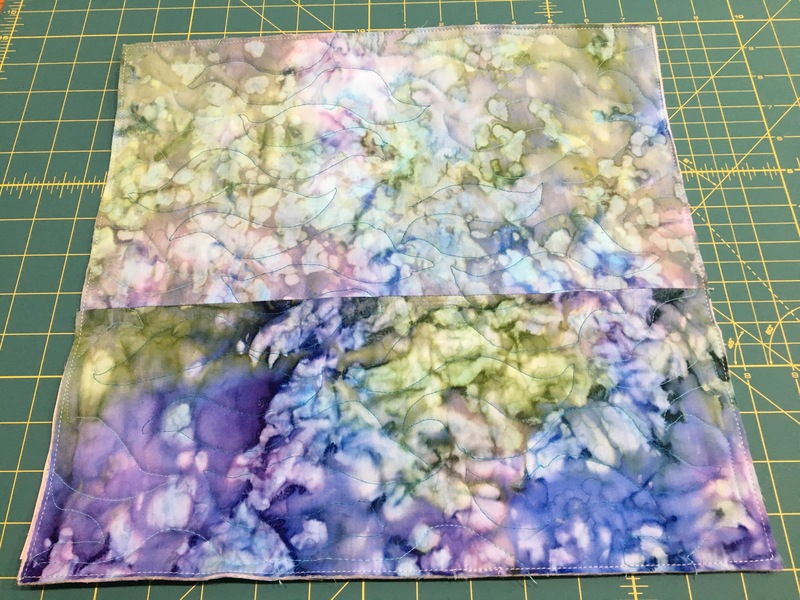 I’m excited to try it out, but we’re going to play with some scrap fabric first. I did learn that lesson at least!